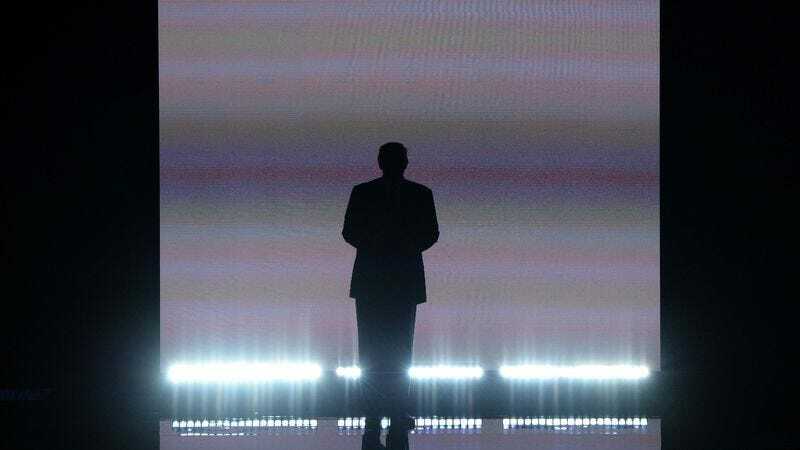 Last night, a thousand Twitter eggs incubated beneath the heat lamp of festering Republican rage in what was the first of … four nights of the GOP convention? Jesus. Anyway, those assembled delegates who are so empowered with making life-altering decisions on behalf of their countrymen and other people with dumb hats were treated to a night of incoherent sloganeering, hammy yelling, and C-list celebrity befitting a coronation of Donald Trump—from Rudy Giuliani yelling at America for blocking his driveway, to future Secretary of Being In Charge Scott Baio issuing a call to “Make America America Again” that made only slightly less sense than the plot of Zapped. But what about the music, man? Remember when the gaudily empty pantomime of democracy was all about the music? The Grand Old Party does, which is why it hired former Saturday Night Live bandleader G.E. Smith to once again fill the dead air between outlandish political parodies with song. Smith—a mercenary pro who just goes where the work is—directed his gaggle of fiddling Neros through a corporate picnic-friendly set list of classic rock songs by Stevie Ray Vaughn, The Who, Rod Stewart, The Knack, and so on, while poor Chris Christie probably sat there bellowing an unanswered request for “Thunder Road.” It was all mostly uncontroversial—and hey, nice to see Creed’s Scott Stapp is getting some work. But there were occasional moments when the band inevitably got bored with making background noise for people in stars-and-stripes ties to clap arrhythmically to, so they did one for themselves. Rush’s “Limelight” was an odd choice, though its lyrics—“Cast in this unlikely role / Ill-equipped to act / With insufficient tact / One must put up barriers”—obviously has some undeniable resonance with Trump’s campaign. But there’s no such explaining away the cover of David Bowie’s “Station To Station,” a song from the late singer’s drug-hollowed, Thin White Duke era that, as Slate points out, at one point references “the side effects of the cocaine.” Bowie was singing about love there, though watching the RNC, you could also make the case for paranoia. Unfortunately—or fortunately—Bowie is dead, so he wasn’t around to witness this surreal spectacle (and missed opportunity to do “Man Who Sold The World”). The same cannot be said, however, for the very much alive singer of The Turtles, Howard Kaylan, who threatened legal action over the band’s appropriately listless rendition of “Happy Together,” only to discover mere hours later that—as any patron of suburban bars could tell you—the law cannot protect you against cover bands. But whatever advice May got or steps were taken were clearly not enough, as Trump still blasted it last night like a triumphant political warrior/Little League team, to May’s continued dismay. And the fact that Queen frontman Freddie Mercury—a bisexual man from Zanzibar—likely wouldn’t have been thrilled with a lot of the GOP’s platforms didn’t go unnoticed either, with everyone from California’s Lt. Governor Gavin Newsom to Sting to anyone who’s even glanced at Mercury’s Wikipedia page pointing out the problem. But of course, the unauthorized cover version everyone is talking about today is Melania Trump’s speech, which seemed to lift entire passages from Michelle Obama’s speech at the 2008 Democratic convention. The ensuing plagiarism accusations have, like most Trump scandals, been shrugged off by his campaign as simply a matter of shared “common themes” and “similar sentiments,” or—according to Trump campaign manager Paul Manafort—of Hillary Clinton being threatened by another woman, which he believes spurred a jealous Clinton to orchestrate this fiendish plot of people pointing out words. But while she may have been behind Wordghazi, could Clinton have also secretly arranged Melania Trump’s apparent Rickroll? As noted almost instantly by Clinton’s vast goon-army of readers, Trump’s speech also contained these lines: “He will never, ever give you up. And, most importantly, he will never, ever let you down.” Inspiring words, and ones that should sound familiar to anyone who’s used the internet within the past decade, clicked on a link promising something that sounds too good to be true, then been greeted by the video for Rick Astley’s 1987 hit “Never Gonna Give You Up.” Its subtle placement within Trump’s speech in lieu of actual worthwhile content certainly didn’t go unnoticed, and it quickly inspired the inevitable YouTube mash-up. Did Melania Trump—or whoever, besides Michelle Obama, helped with her speech—include this as an intentional bit of trolling, perhaps to once again push the limits to which her husband’s campaign can test the nation’s patience with zero consequence? Probably not. According to Trump spokesman Jason Miller, Melania and her “team of writers took notes on her life’s inspirations, and in some instances included fragments that reflected her own thinking,” suggesting Melania has perhaps always found Astley’s blue-eyed soul-pop deeply moving. Either that, or its subtle inclusion reflected her thinking that, like the Rickroll, this whole campaign is a joke that stopped being funny a long time ago. Anyway, only three more days of this!